It’s all just a bit depressing at the moment isn’t it? Each time I glance out of the window there is never even a peep of blue sky and hardly any bright daffodils to remind me it is in fact Spring. But no matter. When times get like this there is only one way to improve the situation; to fill your belly with buttery things. Perhaps not the healthiest advice to give, a more svelte person might suggest a nice jog in the park but it wouldn’t quite cut the mustard for me. No, when my fingers are still blue in March I need chocolate and sticky sweet things. That’s where these Spelt and Dark Chocolate Pancakes fit in nicely. Rachel’s Organic sent me some Greek Yoghurt with Honey to try and I thought it would work nicely with these pancakes. Start by sieving the flour, baking powder and sugar into a large bowl. In a separate bowl mix together the melted butter, egg and milk until well combined. Stir the egg mixture into the flour mixture and add the chocolate chips. Give everything a good stir to make sure it is well incorporated. Heat a little knob of butter in a frying pan until it just starts to foam and then drop the pancake mixture in using around 2 tbsp of the batter for each pancake. Fry the pancakes until they are golden brown before flipping them over and cooking the other side. Don’t be tempted to flip too early as you could end up with miserable looking pancake. Cook the pancakes in batches until all the batter is used up then stack them as high as you like, drizzle with honey and serve with a big dollop of honey yoghurt. I like to think that the spelt part of these pancakes means they add a fibrous benefit that negates the chocolate, sugar and butter. In reality I know that by eating eight of them I am waiting for the coronary police to come knocking. 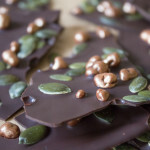 However as these are a treat I’m not too concerned and they are a delicious thing to make to accompany some yoghurt that might otherwise have been eaten with a simple banana. So while I am enjoying this meteorological nuisance by stuffing my face, when the weather does improve I’m sure to start creating lighter and healthier things. Yeah, right. Thanks to Rachel’s Organic for the samples. All opinions expressed are my own. 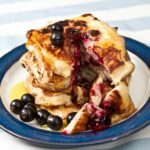 I am really into spelt flour and love it’s flavour so imagine it works brilliantly in pancakes, particularly when you add chocolate and serve them with a very good Greek yoghurt. Divine! These look healthy and I love it with the chocolate sauce. Have just bought lots of spelt flour from Gilchesters organics. These look like a great healthy but scrummy recipe to use it in. Seems you get better than honey and chocolate! They look gorgeous, that honey dripping nicely from the pancakes looks divine..yum! Realmente lucen lindos y deliciosos con salsa de chocolate están irresistible me encanta,hugs,hugs. i don’t generally love pancakes but this looks and sounds fabulous!! YUM! as far as i’m concerned, one of the few redeeming qualities of winter is that we can soothe ourselves with fatty, rich foods and not feel so ashamed. 🙂 lovely recipe! I never tried spelt but yours looks fabulous! 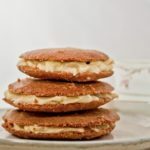 I love pancakes and I love spelt – these look great and I like the flavor combination. We’re having the same ridiculous weather! I think your marvelous, slightly decadent pancakes would be the perfect way to bring a smile to my morning!